Many of our visitors have been guests at our new book release tea parties here at Colonial Quills. So, I thought I'd share some highlights from a delicious book entitled Tea Drinking in 18th-Century America: Its Etiquette and Equipage by Rodris Roth that can be found in its entirety at Project Gutenburg. Some of the information is seen through the foreign observer of American customs. Today I will share some vignettes about the tradition and art of Taking Tea in Part 1. Tomorrow I will share a bonus post, Part 2, on Tea Equipage. Excerpts will be found in italics, while I supplement my own comments in regular text. 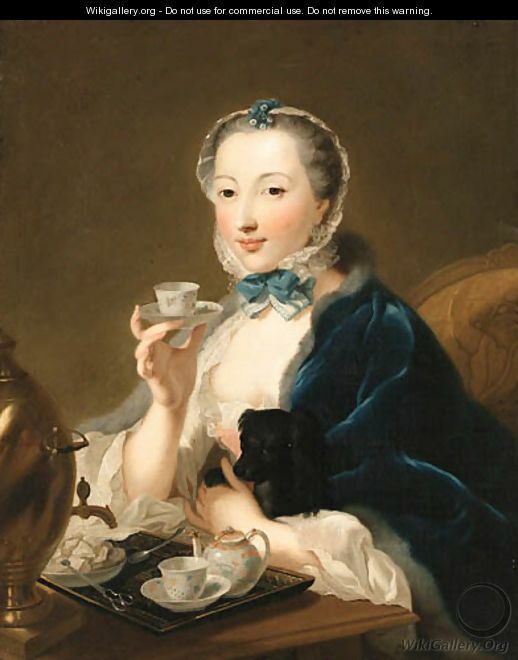 At first the scarcity and expense of the tea, the costly paraphernalia used to serve it, and the leisure considered necessary to consume it, limited the use of this commodity to the upper classes. For these reasons, social tea drinking was, understandably, a prestige custom. 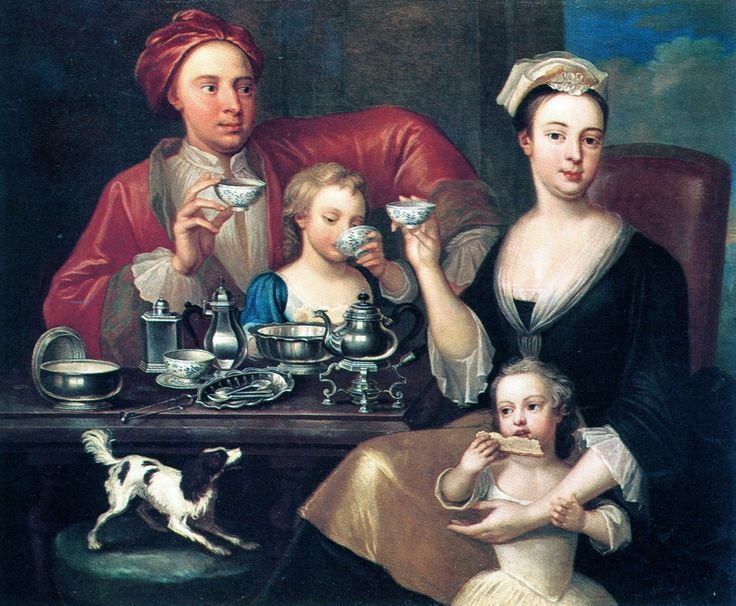 In America, as in England, tea had a rather limited use as a social beverage during the early 1700’s. . . At this time ale and wine, in contrast to tea, were fairly common drinks. Colonial gentry in Virginia and in the Carolinas a preference was showed for "sober liqueurs," while the common partaking of tea caught on slower in New England. English customs were generally imitated in this country, particularly in the urban centers. Of Boston, where he visited in 1740, Joseph Bennett observed that “the ladies here visit, drink tea and indulge every little piece of gentility to the height of the mode and neglect the affairs of their families with as good grace as the finest ladies in London.” . . English modes and manners remained a part of the social behavior after the colonies became an independent nation. 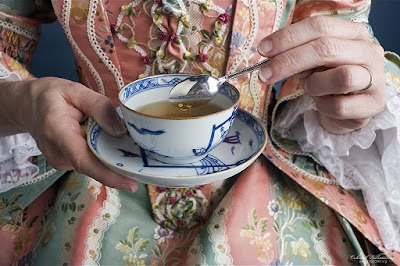 . . During the 18th century the serving of tea privately in the morning and socially in the afternoon or early evening was an established custom in many households. . . This tea-drinking schedule was followed throughout the colonies. In Boston the people “take a great deal of tea in the morning,” have dinner at two o’clock, and “about five o’clock they take more tea, some wine, madeira [and] punch,”reported the Baron Cromot du Bourg during his visit in 1781. The gracious art of brewing and serving tea was as much an instrument of sociability as was a bit of music or conversation. . . Tea seems to have been the excuse for many a social gathering, large or small, formal or informal. And sometimes an invitation to drink tea meant a rather elegant party. . . At tea parties, cakes, cold pastries, sweetmeats, preserved fruits, and plates of cracked nuts might also be served, according to Mrs. Anne Grant’s reminiscences of pre-Revolutionary America. . . Sometimes wine and punch were served at teatime, and “in summer,” observed Barbé-Marbois, “they add fruit and other things to drink.” Coffee too might be served. As the Frenchman Claude Blanchard explained. 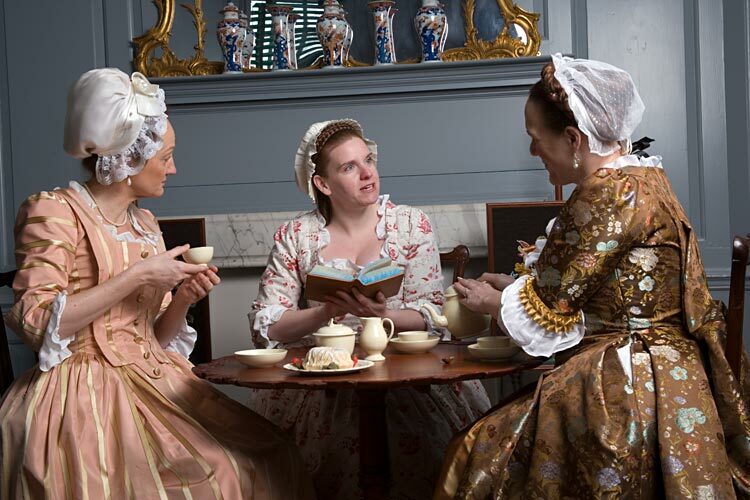 Obviously, young men and women enjoyed the sociability of teatime, for it provided an ideal occasion to get acquainted. . . 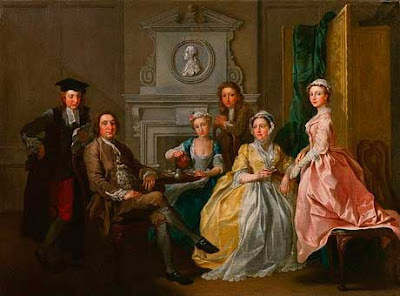 Tea was not only a beverage of courtship; it also was associated with marriage. Both Peter Kalm, in 1750, and Moreau de St. Méry, in the 1790’s, report the Philadelphia custom of expressing good wishes to a newly married couple by paying them a personal visit soon after the marriage. It was the duty of the bride to serve wine and punch to the callers before noon and tea and wine in the afternoon. equipage depict the importance of tea in society. 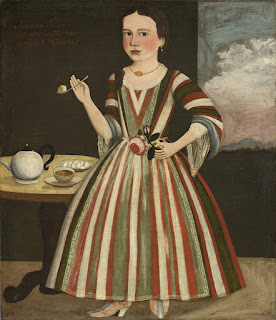 Throughout the 18th century the well-equipped tea table would have displayed most of the items seen in this painting: a teapot, slop bowl (for tea dregs), container for milk or cream, tea canister, sugar container, tongs, teaspoons, and cups and saucers. These pieces were basic to the tea ceremony and, with the addition of a tea urn which came into use during the latter part of the 18th century, have remained the established tea equipage up to the present day. 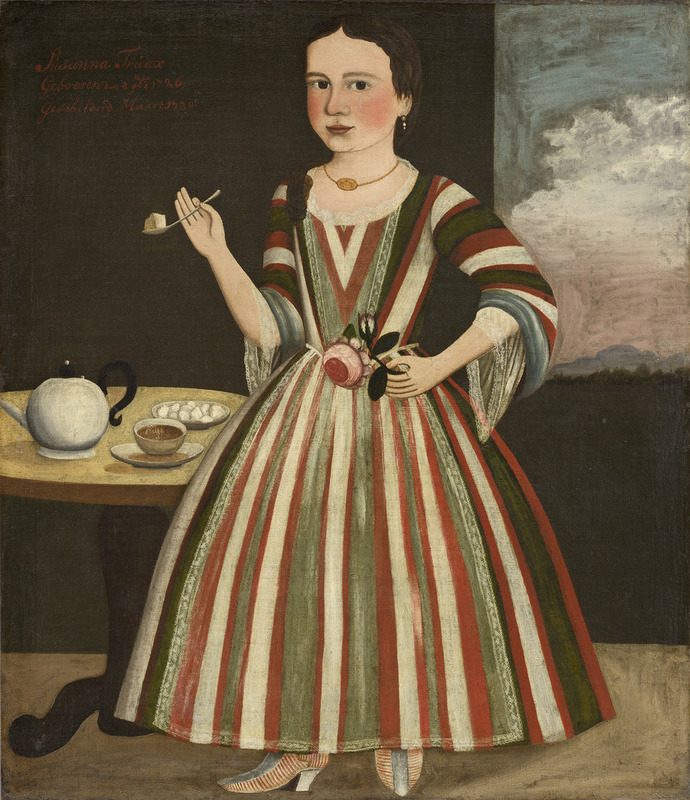 While the Americans, as the Europeans, added cream or milk and sugar to their tea, the use of lemon with the beverage is questionable. Nowhere is there any indication that the citrus fruit was served or used with tea in 18th-century America. Punch seems to have been the drink with which lemons were associated. Some of you may be surprised to learn that tea in the early 18th century was sipped from small porcelain tea bowls, not handled tea cups. Some even drank from the saucer. However, the practice of saucer sipping, while it may have been common among the general public, was frowned upon by polite society. The fact that Americans preferred and were “accustomed to eat everything hot” further explains why tea generally was drunk from the cup instead of the saucer. According to Peter Kalm, “when the English women [that is, of English descent] drank tea, they never poured it out of the cup into the saucer to cool it, but drank it as hot as it came from the teapot.” A “dish of tea” was an expression rather than a way of drinking tea in the 18th century. On the table a saucer seems always to have been placed under the cup whether the cup was right side up or upside down. When one had satisfied their appetite for tea it needed to be done with grace. To politely decline another serving of tea without offending the hostess one must adhere to the ceremony of the spoon by turning the cup upside down and placing a spoon upon it. During his visit to Philadelphia in 1782, Prince de Broglie was advised by the French Ambassador that: "It is almost as ill-bred to refuse a cup of tea when it is offered to you, as it would [be] indiscreet for the mistress of the house to propose a fresh one, when the ceremony of the spoon has notified her that we no longer wish to partake of it." As we know, at times tea was forsaken in the colonies, save for American grown substitutes, during the years of taxation from Britain. One expression of distaste for tea, prior to the American Revolution, was shared in a rhyme published in a colonial newspaper. That pleasure’s all fled that I once found in you. Only some silly work that might happen to fall. Which detestable stuff we can quit when we please. For I’ll never be govern’d by tyranny’s laws. Do you enjoy drinking tea or do you prefer another type of hot beverage? Do you have any tea traditions? How often do you drink tea? 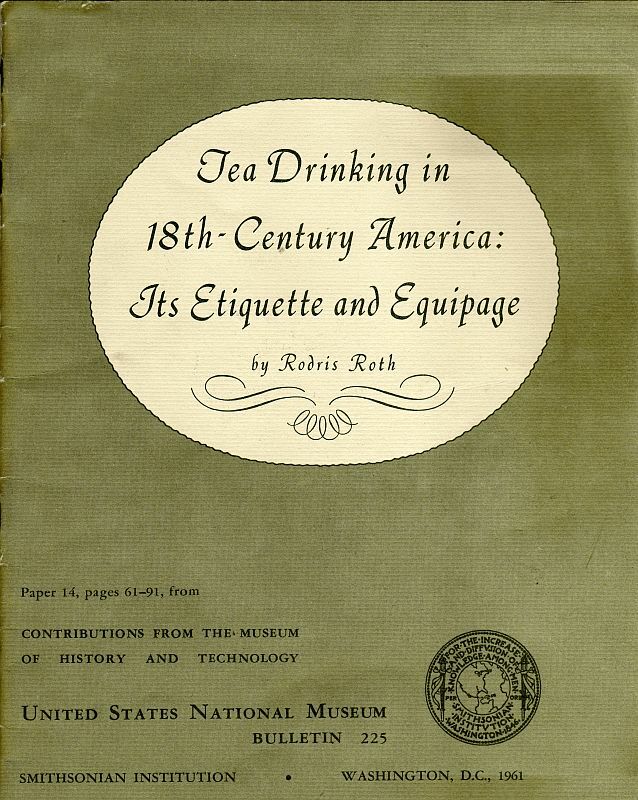 Part 2, Tea Equipage in 18th Century America. 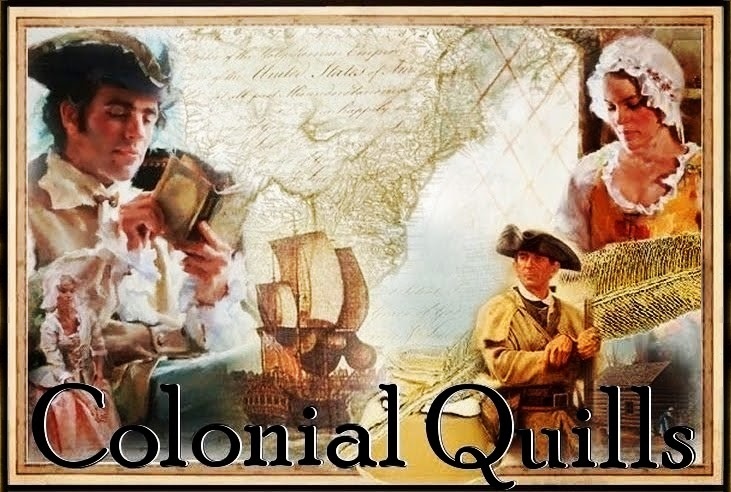 Please be sure to visit us for our next Colonial Quills New Book Release Tea Party this Friday, October 16, 2015. 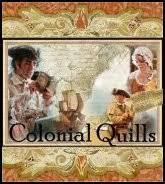 You may join us in the salon (our Facebook event page) and then in our tea parlor here at Colonial Quills. I often drink three mugs of tea a day, but only when there is company (or I'm in the mood to drink tea half the afternoon) do I bother with the tea pot and bone china. I would have a hard time giving it up, even for liberty's sake! You are quite the tea drinker, Rachael.There is something about drinking tea that is just so refreshing and calming. Doesn't it make you feel special to have a cuppa! And even more special to make it in a pot and share with a friend. I have a few one-person tea pot/cup sets which are nice so I can pour myself a refill. Wow Carla, you really shared a lot of information there! Looking forward to our Friday Tea Party! Huzzah!!! I couldn't resist sharing! It seemed timely too since we have our tea party coming up! It will be so nice to see all of our guests dressed in their lovely gowns. Thank you Carla for sharing, this is most interesting. I thought of my grandmother when I read about pouring tea from the cup into the saucer--my grandmother didn't drink tea, she drank coffee and always poured some coffee out of the cup into the saucer and sip from the saucer. As a young girl, I was fascinated by that and didn't understand why she did it. As for me, I drink hot decaf/herbal tea everyday and like it HOT. I never knew of anyone sipping from their saucer, but apparently it was done. I believe to cool the hot tea, but you never know, some folks might just have "always done it that way." Hot tea for me, too! Carla, thank you so much for this informative post. There were many aspects of the tea tradition that I did not know. I enjoy herbal teas year round. I am looking forward to what you will share in Part 2! Only two more sleeps until the tea party!!!! I'm getting excited about our party on Friday! I learned some things I didn't know of as well while reading this fascinating book. It was written in 1961, but is in the public domain. It is so much fun to share from it. I think you'll find Part 2 interesting. I learned quite a bit I didn't know about. See you soon! I love this post, Carla! I've learned so much about tea drinking today. I enjoy a cuppa almost daily, but definitely have coffee every day.